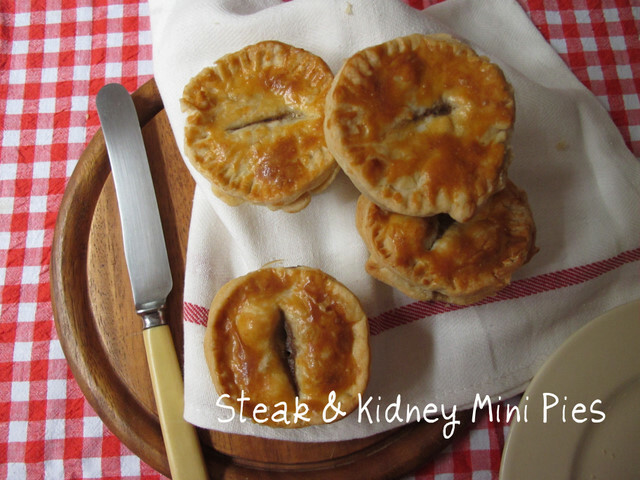 Steak and kidney mini pies... perfect fare for Bonfire Night! Half term saw a lot of visitors to our house; relatives and friends previously kept at bay for several months during the writing of the you-know-what. Every day from Sunday to Friday we had somebody different come round to see us (or Ted to be specific). 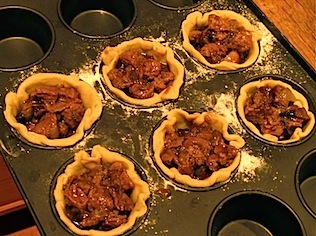 On Wednesday it was the turn of my in-laws and for dinner I made some dinky little individual steak and kidney pies. …and in particular the little pies on the cover. Using a 12 hole muffin tin they’re the dimensions of little pork pies and it amazes me it’s never occurred to me before to use the same tin for pies. It works fantastically well and gives a pie substantial enough to serve for dinner alongside vegetables and gravy or alternatively, convenient and sturdy enough to pop in a lunch box. I am well and truly smitten by the miniature pie, better still, Ted thinks they’re wonderful. This was a labour of love; the steak and kidney had been tossed in flour before browning and casseroling for two hours; pastry that rested in the fridge. All at the same time as entertaining in-laws, my dad and a four year old. I will be cutting corners in future by making up several batches of pastry at a time and keeping some in the freezer. Lashings of egg wash gave them a fabulous gold finish. Ted was most amused I was “painting” my pies. My mother in law is vegetarian so the lonely pie you see on the end of the tray had a different filling; roast butternut squash and chunks of halloumi… wish I’d made more of these come to think of it. 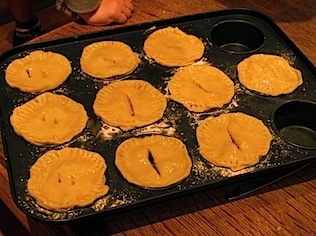 The original recipe said it was enough pastry for 12 mini pies. I had enough for 10 and a small lump left over for possibly one more. Maybe next time I’ll get more confident rolling the pastry thinner, certainly the tops don’t need to be very thick although I wouldn’t want to diddle anyone out of pastry! 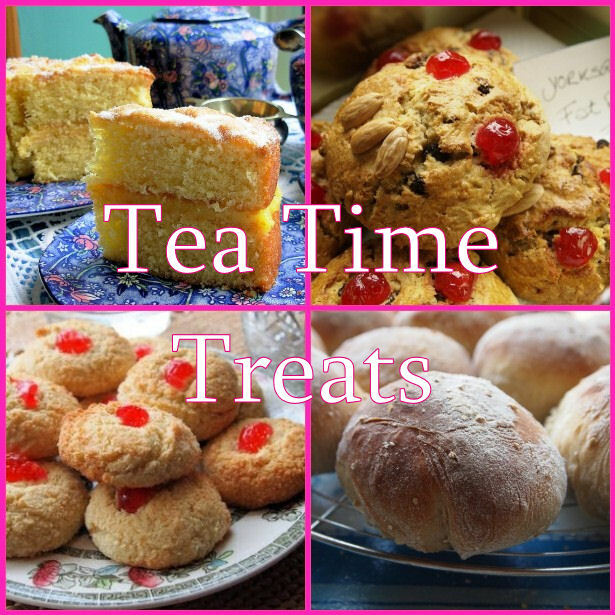 I am sending these to Karen at Lavender and Lovage for this month’s Tea Time Treats which currently has the theme of “Bonfire Treats”. 1. Toss the steak and kidney pieces in flour. Melt some butter in a large saucepan or cast iron casserole dish and brown the meat 4-5 chunks at a time to avoid creating steam in the pan. 2. When all the pieces of meat are browned, return them all to the pan on a low heat and add the mushrooms and stock cube/paste/whatever with enough liquid to nearly cover the meat. Cook on a back burner for 2 hours until tender, stirring occasionally to make sure it’s not sticking on bottom of pan. 3. Meanwhile, make up the shortcrust pastry. Either rub the fat into the flour with your fingers or pulse in the food processor until it resembles breadcrumbs. If you use a food processor (like me) you’ll need to transfer it to a large mixing bowl to bind. 4. To bind, squirt in the mustard and a few tablespoons or the water. Stir with a metal spoon to bring together in large lumps then draw into a ball with your hands. 5. Form the pastry into two flat-ish discs and wrap with plastic film. Chill in the fridge for 30 minutes and around this time preheat the oven to 180c / gas 4. 6. After the time is up, remove from the fridge and roll out on a floured surface. 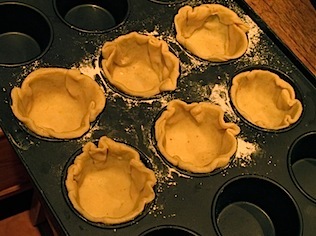 Use 3in and 4in circular cutters to cut out pastry bases and lids. Push into the shape of the 12 hole muffin tin. 7. When the meat filling is cooked spoon some into each of the pie cases leaving most of the gravy in the pan. Press pastry lids on top and press down around the edges with a fork. 8. 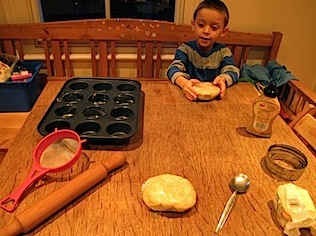 Brush egg yolk on top of the pie lids to glaze; bake in the oven for 25 minutes or until the tops are golden. Allow to cool in the tins for a few minutes then gently prise out and serve. Whizz the remaining liquid with a stick blender for a wonderful gravy. 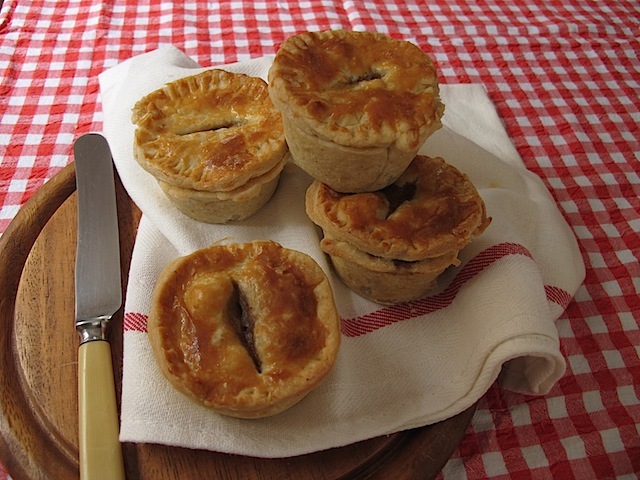 These pies would be perfect for Bonfire Night parties and also super eaten cold at a wintery picnic… or is that just me being “common” as I couldn’t be bothered to heat mine up the next day?! Yep, cold beef pie, they were so good they tasted good cold. Genius!! What an excellent idea. The muffin tin is inspired!! Wonderful! I am a big fan of steak and kidney pie. Oh God- these look so nice I literally want to eat the laptop (although that may be down to the fact that I’ve been up since 5am with Dimples. *sigh*)I’m delighted too to have found a fellow fan of The Works!! Aww they look so cute! Being half the size you can eat twice as much!!! Too cute! I can think of lots of fillings that would work. They would be lovely for a rustic picnic, especially with this amazingly warm autumnal weather we’ve been having. An inspired use of a muffin tin! Thanks Karen, yes I must do that! That pastry looks like melt in the mouth goodness! 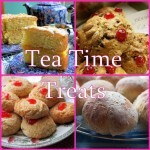 THANKS for linking up with Tea Time Treats and also for sharing your brilliant Bonfire Pies! They look really delicious – don’t know which I’d prefer the beef or the veggie ones! 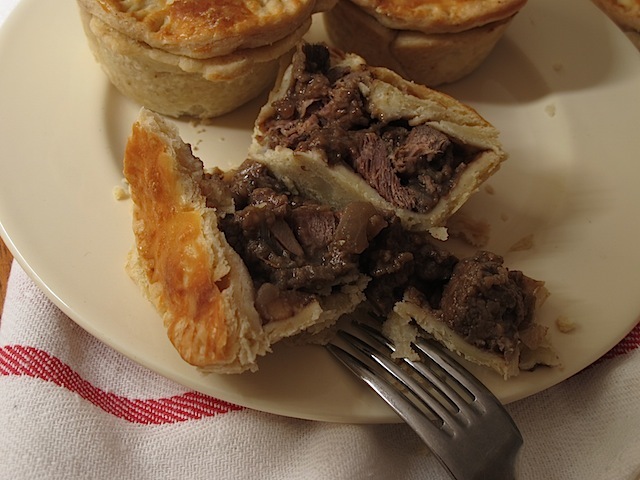 Dinky-Di, true blue, Aussie style pies at that! 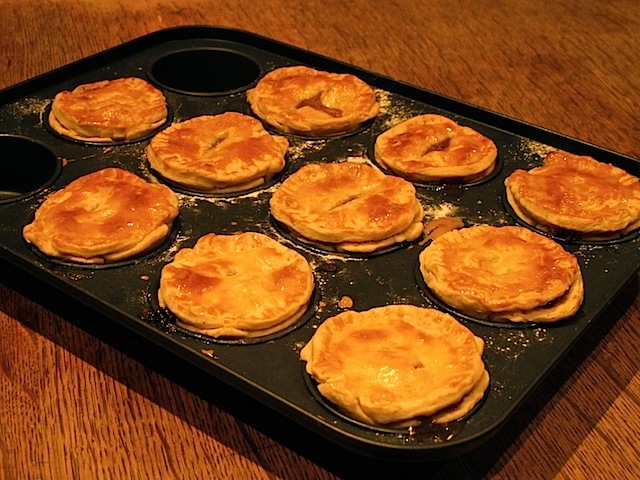 Party pies (as we call them back home) are an Aussie tradition and these look fabulous! What kind of steak is required deadline 9pm super urgent my life depends on this. Braising or casserole steak cut into cubes.